The girls who attended my November Stamp-In created a really pretty wreath card utilizing the Daydream Medallions stamp set. So easy, but looks so classy! Remember how I punched the star for the card in this post from the leftover Real Red glimmer paper I had made for a workshop project? This was that project. I wanted to add some "berries" to this wreath, and couldn't decide what to use, when my eyes landed on the beautiful blue glimmer paper I had previously made for this card. And I thought, why not? So, following the same directions as here, I created a strip of Real Red glimmer paper, and punched the "berries" out with a standard paper punch. Emboss a 3 3/4" x 5" piece of Naturals White cardstock with the Big Shot inside the Vintage Wallpaper Embossing Folder. Adhere this piece to a standard size, 5 1/2" x 8 1/2", Naturals White card base. In Old Olive ink, stamp the largest and the second largest medallions on the Pear Pizzazz cardstock. Using the second largest and the third largest of the Floral Frames Framelits, cut each of the medallions out with the Big Shot. 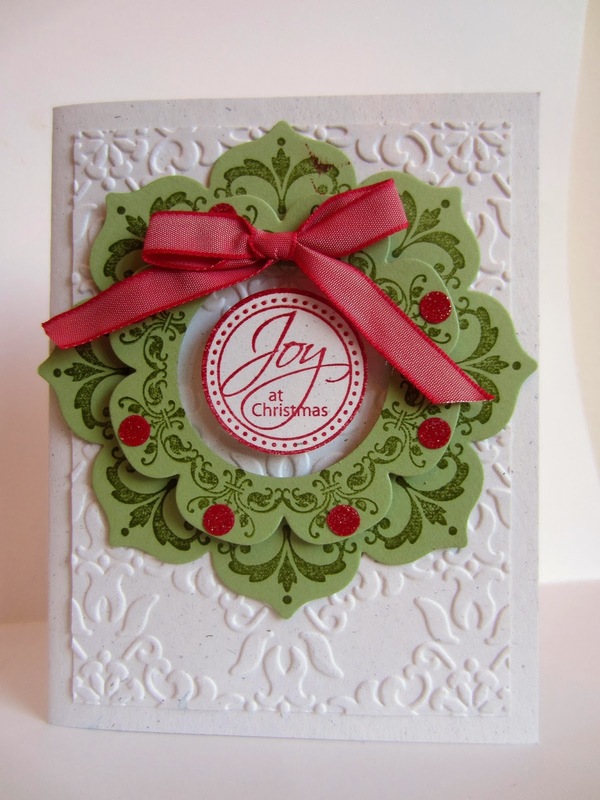 On a scrap of Naturals White cardstock, stamp "Joy at Christmas" in Real Red. 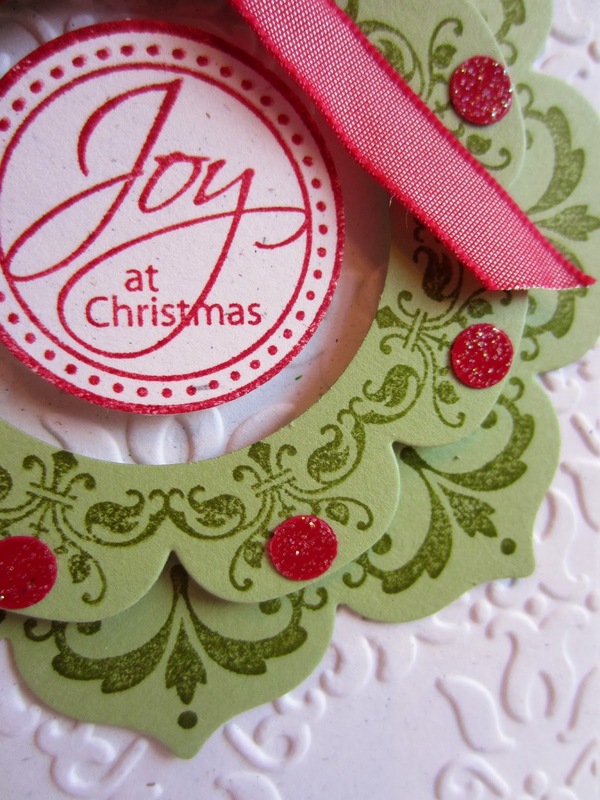 Punch it out with the 1 3/8" Circle Punch, and adhere to the center of the wreath with a Stampin' Dimensional in the center. Tie a bow with the red ribbon, and adhere it to the wreath with a Glue Dot. To make the berries for the wreath, punch them out of the glimmer paper you made, and attach them to the wreath with green glue. Very lovely, and you were right about the berries, they really add something. Saw this at Someday Crafts linky party...beautiful! What a beautiful card - it caught my eye over at the Real Creative Life Link Party! Yes, it truly is classy! Your card is absolutely beautiful! Thanks for linking up to Create Link Share! This is such a beautiful card and you're right, the berries add the perfect something extra. Thank you for linking to the In and Out of the Kitchen Link Party. I look forward to seeing you next week. This card is beautiful! Thanks for sharing this great project at The Pin Junkie. It was featured in this week’s Christmas craft roundup. http://www.thepinjunkie.com/2013/12/christmas-crafts-and-printables.html I hope you’ll stop by to grab a featured button and share your best Christmas recipes at tonight’s party for another chance to be featured! Wishing you very happy holidays! Wonderful! Thank you for participating in the project Handmade Cafe!